Will you play as Piro the wizard who shoots exploding fireballs, Boris the warrior who swings his trusty axe or Kadira the archer who shoots arrows from afar? Pick an ability to bring with you into battle such as the hidden mine, the exploding barrel, long shot or the rats' nest and start playing against hundreds of players. Once a round starts, pick your starting location and search for crates and abilities to pick up. Plant turrets, spawn monsters to defeat your enemies. But watch out for the advancing noxious fog. Rounds last only a few minutes so you can go ahead and take that bathroom break or make that cup of tea. Be the last mage standing to win! We are excited to announce our newest game, Arx Arcana: Last Mage Standing. 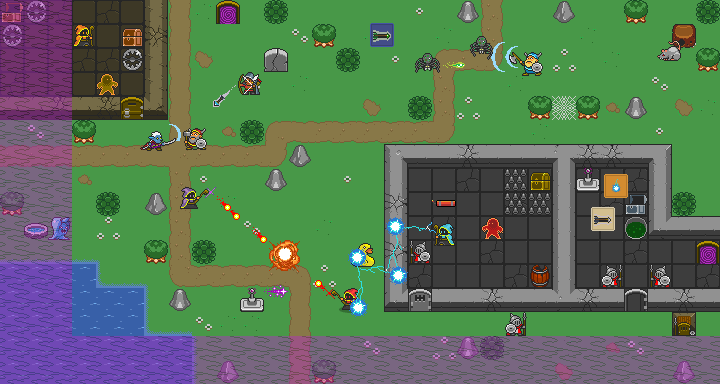 In this 2D fantasy battle royale, you cast spells, build traps and fight to survive against a hundred other players. In Arx Arcana, you battle by casting spells, summoning monsters, building castle walls, traps and rubber duckies. Be the last mage standing to win. Arx Arcana will be launching on the web in early 2019 with more platforms to come later. We are looking for playtesters to help us refine and balance the game. To learn more about the game and sign up to be an alpha playtester, head over to arxarcana.io. Age of Rivals has been nominated for Best Mobile Game at Playcrafting's 2017 Bit Awards! Age of Rivals’ next content update is here, featuring 18 new cards, new story/challenge levels, and several gameplay improvements. Read on for details. The second campaign includes 6 new story/challenge levels vs. custom decks for Ziana, Theophilos and Nairi. Beating these levels will unlock 3 of the new cards. Barduk’s Bonewall - You bring the bodies and Barduk will build you the wall. Royal Academy - See the Moneylender for a student loan. Standard Bearer - Don’t mess with the mascot. Martyr - Sometimes death is only the beginning. Martial Law - Culture smulture...just attack! Acid Spitters - The sworn enemies of The Undying. Exotic Trinkets - Shells, beads, and the occasional dragon egg. Princess of Thieves - Her leadership will bring the underworld out of the shadows. The Sentinels - No shenanigans on their watch. Eternal Gardens - A whole grove of giving trees. Faithless Bannermen - Your earliest allies are not always your most reliable allies. Exotic Expedition - Riches beyond compare...if they ever make it back. Smoke and Mirrors - It’s not a trick..it’s an illusion! Monolith - A mysterious construction for anyone confused by the damage splitting rules. Stone Table - Broken - When the table cracks, death itself begins working backwards. Scavengers - Waste not, want not. Sacred Relic - An artifact that should never have been uncovered. Open Borders - Keep the big door open...everyone will come around. This update also includes several bug fixes. I hope you enjoy the new content! 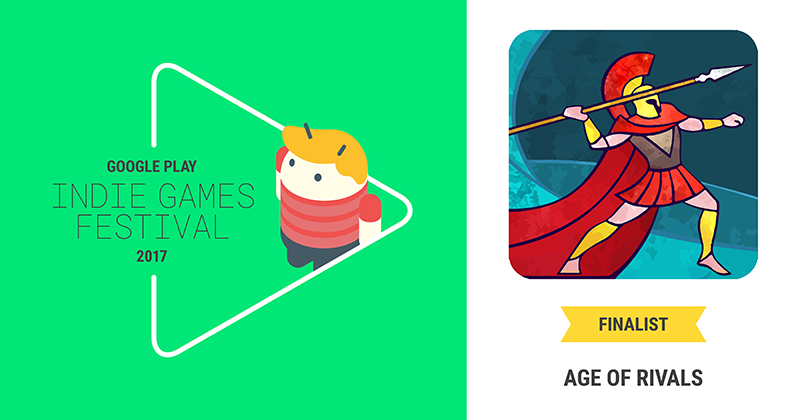 We are very happy to announce that Age of Rivals has been selected as one of the 20 finalists for this year's Google Play Indie Games Festival! We have been invited to present our game in competition in San Francisco on September 23rd, and we would love for our fans to join us there. Out of the 20 games selected to exhibit, 10 will be chosen by audience voting to present on stage, and then 3 winners will be chosen by a panel of judges. In Google's words: To celebrate some of the latest innovative indie games on Google Play, we’re hosting the second Indie Games Festival in North America on September 23rd in San Francisco. At the festival, Android fans and gamers will have a unique opportunity to play new and/or unreleased indie games from some of the most innovative developers in the US and Canada, as well as vote for their favorite ones. It's great to have an opportunity to work with Google to bring digital-first board games to more players. We are thrilled to be a part of this event, and we hope to be able to meet some of our fans there as well! One of the things players seem to like about Age of Rivals is the quality of the AI opponent. A small minority of players have even jumped to the conclusion that the AI must be cheating (it’s not). I’ve been asked how it works behind the scenes, so I’m dedicating this blog post to that topic. I will go in-depth on the AI logic and also provide some interesting stats. The initial goal of the AI was to provide a good learning experience for new players, at which point players would transition into playing multiplayer exclusively. But as we realized that there was a significant number of players who wanted to play single player, I kept improving the AI to play at a higher level. Which card to draft out of a possible pool of 3 or 4 cards. Which cards to assign any opponent damage to. To make the first decision (what to draft), the AI scores each card across 17 different categories. For each category, a function examines the card and the current state of the game and returns a score between 0 and 1. Then the AI weights each of these results, averages them into an overall score, and drafts the card with the best overall score. Weights for the categories range from 1 (not very important) to 20 (very important). How much of a discount am I getting on this card? How much tax do I have to pay my opponent for this card? How affordable is this card given how much Gold I have left and how many cards I still have to buy this round (so I won’t end up with Waste). How many new resources will I get with respect to how many resources I and my opponent already have and which round we are in. How much income will this card generate with respect to how much income I and my opponent already have and which round we are in. How much immediate gold will this card give me this round? How much culture will this card give me with respect to which round we are in? To what extent does this card allow me to win additional conquests? To what extent will this card allow me to make a dent in my opponent’s current armor? To what extent will this card help me deal with my opponent’s upcoming attacks? How well does this card combo with my other cards currently in the field this round? How well does this card counter my opponent’s cards currently in the field this round? How well does this card combo with other cards I have drafted for my city so far? How well does this card counter the cards my opponent has drafted for his/her city so far? How well does this card combo with the 4 cards my opponent might pass to me next turn? How well does this card counter the 4 cards my opponent might draft this turn? Does my opponent have cards in the field right now that counter this card? Does my opponent have cards from previous drafts that counter this card? How well do the other 3 cards I must pass to my opponent counter this card? How well do the 4 cards my opponent might draft counter this card? Special card-specific weighting to help the AI understand when to use cards with abilities that are not covered by the default combos and counters logic. The first 10 categories are fairly straightforward. The AI looks at the current state of the game (how much culture/armor/attack/economy each player has and what round it currently is) and tries to find the card that will best benefit it. The last 7 categories attempt to handle Abilities, which are trickier. It is assumed that the cost of each card is fair and accurately reflects its value under ordinary circumstances, so the AI is basically looking for extraordinary circumstances to take advantage of. If it has a lot of Infantry cards, then Shieldwall is a high value card since that ability represents a combo opportunity with Infantry cards. Categories 11-16 (combos and counters) handle most card abilities, and for a long time that seemed okay enough. But it eventually became obvious that for some cards it’s harder to describe what a combo or counter is, and so category 17 was added to provide custom logic for those cards. Examples include Plaguebearer, Master Thief and The Oracle. These are cards that you should only buy under very specific circumstances, and if the AI buys one when it shouldn’t, it can ruin the illusion of intelligence completely. About 25 cards have such custom logic. The first version of the AI probably only had about half of these categories. Whenever I embarked upon a series of AI improvements, I would simply play a game and wait for the AI to do something that seemed obviously sub-optimal, and then I would analyze its logic to figure out why it made that choice. This usually resulted in a re-write of a category, the addition of a new one, or the adjusting of weights. Combat damage assignment follows a similar pattern, but with only 10 categories. The AI randomly assigns damage and then calculates the total value of the cards left over. It does this 1000 times and then picks the permutation that resulted in the highest total value. I probably could have done this in a more rigorous way, but in practice it seemed to work pretty well so I never improved it. What is the scoring value of the leftover card? What is the overall value of the leftover card, as defined by its base cost? How much armor does the card have leftover after damage has been assigned? Is this card currently buffing the culture value of other cards? Is this card currently contributing resources or income? Does this card have a post-war or end-of-round ability that will trigger? Custom logic to account for certain cards that you should or should not sacrifice under very specific circumstances. One example is Shock Troops, which should almost always be sacrificed since it’s going to ruin itself anyways (unless it received a Culture buff). Currently six cards have such custom logic. Over the past year I’ve released several sets of category weightings, including ones that favored more combat, more culture, and everything in-between. I’ve measured their various win rates and removed poorer performers over time. There is only one AI out in the wild currently. So what’s the difference between the Normal and Hard AIs? They both use the same set of weights and the same categories of logic. But the Normal AI just chooses to ignore some of the logic some of the time, randomly. This is an attempt to simulate a human player occasionally missing something. The Normal AI wins about 40% of games against all players. The Normal AI wins about 37% of games against players who’ve been playing for at least a week. The Hard AI wins about 61% of games against all players. The Hard AI wins about 54% of games against players who’ve been playing for at least a month. So both AIs become more “beatable” as players get more experience. But the Hard AI in particular has the potential to stay fairly competitive. But of course there are some players who beat the average and crush the AI 80-90% of the time. They have probably come up with a play style that is particularly effective against the AI's logic and weights, and over time I can try to improve the AI by analyzing their games in particular. The ability to consider all these different aspects of the game. Humans can do this as well though, and the best players do. The ability to remember cards that were drafted in prior rounds that aren’t currently on-screen. The ability to ignore prior strategies and adapt to changing circumstances. Sometimes humans (like myself) try to play out a particular strategy and are too slow to adapt when it’s clear that it’s not going to work out. It still doesn’t understand the nuances of every ability perfectly, and it over-simplifies many of them. It makes no attempt to Guarantee cards that work well together, or that are even known to be useful cards. Most humans know over time which cards are better Guarantees, but the AI always chooses these at random. It has no understanding of the current “meta” or which cards are perceived to be better than others. It does not have access to any card win rate data, even its own. Humans remember which cards served them well in the past and can take advantage of that knowledge, but the AI plays every game as if it was its first. Some next steps towards improving the AI could be to analyze games against players that have high win rates vs. the AI, teaching the AI about more abilities, teaching the AI to be more strategic with the Guaranteed Cards system, and continuing to test alternative sets of weights. And I’ll say it one more time. The AI does NOT cheat in any way whatsoever. It has no access to extra information. It does not manipulate the random draft. It does not know which card you drafted before it makes a decision. I hope this has been interesting, and as always I’m happy to answer any questions! Well, one week into mobile and we've already got a feature update! Now you can play most of the game offline without even registering an account. I've also fixed the screen rotation issue, made the first 10 missions dismissable (once every 24 hours), and added better handling of failed network saves. All of these also apply to the Steam version (except auto-rotate, although that would be funny). Don't forget that today is the last day of our launch week discounts for iOS and Android! I also think today is the last day of the Steam Summer Sale discount. So now is the time! Offline mode support combined with automatic syncing across multiple devices and platforms is a bit tricky, so I added a new FAQ with more details, which I will also flesh out with other topics of interest. Many thanks to the Touch Arcade community for providing excellent feedback, conversation and even volunteer testing. Many thanks to David Neumann of Stately Play and iOS Board Games for being an early supporter of the game and helping us get our first round of beta testers almost a full year ago when it was just a web game on this web site. Also thank you to mrbaconpants for creating and moderating an Age of Rivals subreddit and to Lycentia for starting an Age of Rivals wiki. And thank you to everyone else who's provided feedback, bug reports and encouragement on this long road. Especially Curt and Mathilde of Roboto Games who are always willing to help me tackle the really tough problems. There is still much to do, so keep an eye out for future updates! Age of Rivals launches on Android and iOS on Thursday, June 22! Just like the Dragoons of old, Age of Rivals is going mobile. We finally have a firm date for our mobile/tablet launches: June 22. We've been quietly beta testing for the past few weeks to make sure everything looks stable, and now we're ready to go! In celebration of these launches, we've reached out to our Moneylenders and convinced them that for the first week the game will be on sale for $.99. Make sure to grab it and take advantage of this launch discount! We hope you enjoy being able to play from the convenience of your phone or tablet! We'll post the links to the stores on Thursday when the game goes live. Thanks! Today's medium-sized update aims to address a few player-requested issues before we officially launch on mobile. This also includes our second round of card balance tweaks. We analyzed game data and read all the comments on both Kongregate and Steam forums before deciding which cards to change. The biggest source of controversy recently has been Graverobber Baron. We agonized over this one, but ultimately we decided to leave it unchanged. There were good arguments on both sides, but we were more swayed by the players who wanted to keep it as-is. We think this card plays an interesting and somewhat unique role in the overall composition of the game. The game benefits from having dramatic late game cards that can turn the tide in big ways, and GB is not really one of the more OP ones. It has almost exactly a 50% win rate, which is lower than several other cards. But we still might change our minds in the future, so keep letting us know what you think. Friend games no longer have a turn timer. You will now hear an audio warning during timed games when you only have 5 seconds left. This will only happen if you have Sound Effects turned on. The Normal AI is now a little easier. The Hard AI is still the same. We hope you enjoy these changes! Our next big update will be to get this game onto mobile finally. Age of Rivals players have always been able to see their monthly rankings in a limited way in-game. We show you your Tier, and the top 100 players can see their exact rank. Now we're making historical top 100 lists publicly available to all players on our website. You can see them at http://robotogames.com/age-of-rivals-leaders/. Today's update brings more player-requested improvements to the game, mostly involving tooltips. 1) We now highlight buffed stats in green and debuffed stats in red. If you mouseover these stats, the TOOLTIPS will show you where the buffs/debuffs came from and whether or not they are temporary. This should make it much easier to figure out why a stat changed. 2) The tooltip for a card's gold cost will now show you what the original cost of the card was before it got discounted. 3) The tooltip for resources will now tell you which type of card that resource is most helpful for. These improvements should make it even easier to learn the game and the relationships between the various cards and elements. This is live on both Kongregate and Steam. Thanks! Help Age of Rivals get on Steam by voting for the game to get through Greenlight. No in-app purchases in this edition. All cards and characters unlock at a fast pace just by playing the game. (If you have spent $10 or more in the Kongregate version of the game, please email support@robotogames.com to receive a free copy of the Steam version when it launches.) Thanks in advance for your help! Learn how to run a great civilization in 10 easy steps with our new trailer. Age of Rivals was featured on the front page in the Hot New Games section for the past 2 weeks. We are so thankful to our Kongregate users who have responded very positively to the game and rated it a 4.2 out of 5 with over 100,000 plays. It's been wonderful seeing so many people in the chat and so much activity in the forums. Today's update brings some small but often requested changes to the game. One of the more common feature requests in Age of Rivals is for slightly more control over strategy by way of more deck-building. However we also often hear that players like that there is less deck-building in this game, and that they would prefer it stay this way. We are also aware that most players don't even get to fully try out the current level of deck-building, because most players never get to the point where they can Guarantee more than one card. Playing with 3 Guaranteed cards feels pretty different than playing with just 1 (we think). So before we make any changes, we want to allow more players to play the game as intended. To that end, we have reduced the number of Rival Cards you have to get to unlock the 2nd and 3rd slots on every rival. It used to be 2/10/25, and now it is 2/5/10. This means that many of you will likely have more slots unlocked the next time you load up the game. Another frequent request is to be able to earn coins by playing the computer. So we have also added a reward for beating the computer, including Easy, Hard and Campaign games. It's not as much as for beating a human (and you get nothing for losing), but it's something. Finally, we have removed the intro Friend Mission, because many players have a hard time completing it. If you already have it in your Mission List, it will be dismissible. Thanks for all the feedback! We hope these changes improve everyone's experience. We have also been working on bringing Age of Rivals to more platforms. More news on that soon! Empire Rank - Stats are now being tracked for all “Vs Anyone” games, and players can earn up to 1000 Science each month based on how high they rank. This is our first take on tournament-style play, and we will continue to improve it over time. You can see your stats in the Empire view (Rank VIII is the lowest and Rank I is the highest). Empire Alliances - Players can now form Alliances with up to 10 members, and each member can earn bonus coins every day based on how active the Alliance is. Over time, we will expand what Alliances are used for (let us know your ideas), but for now it’s a great way to earn coins faster and find friends in the community. Every member in the Alliance gets 10 coins for each member that won a game (Vs Anyone) the previous day (up to 100 coins per day). Campaigns - Our first Campaign is here! Campaigns are custom single-player levels that players can master to earn new unique never-before-seen cards. They are designed to be challenging but fun, and may require several tries (with different guaranteed cards) to win. This first campaign rewards Lorenzo, Xiong and Soraya rival cards (2 each) plus 3 new Epic cards. More Missions - A new mission will appear every 12 hours now instead of every 24 hours. So that means two missions per day instead of just one. Just like before, missions will accumulate even while you’re away (up to 3) so if you only play once per day, you will still get two new missions when you return to the game. Fast Mode - For advanced players who want faster games, we’ve added a “Fast Mode” button in-game next to the menu button. This will speed up all animation in the game, but is currently only enabled for single player games (Vs Computer and Campaign games). We’ll possibly add it as a matchmaking feature too if it is popular. Shop Specials - We will be trying out various special deals in the shop (Kongregate users only). Right now every player can get a bundle of 25 card packs for only 50 Kreds. Epic Card Drop Rate - We’ve made it a little easier to get epic cards in card packs. Rule Change - Multiple guaranteed cards of the same phase will now try to draw on different turns instead of always drawing on the same turn. Updated Art - Lots of new art throughout the whole game. Rival Stories - Character backstories in the Rivals view for most rivals. Card Fixes - Multiple card tweaks and fixes. One notable change is that “Maracena Dancer” and “Another Horseman” can no longer be drafted by the other player. They will now get replaced if passed. Hope you enjoy the new stuff! Let us know what you think! Our next major update is ready, and it introduces the concept of your Empire. Over time, we will expand upon this concept, but the part that we are releasing first is Missions. Missions are daily goals that you can complete for rewards such as coins and rival cards. By completing missions, you will be able to unlock cards and rival slots more easily than before. The good news is that Missions make it easier to earn rewards for more varied play styles. Based on which Missions you get, you can earn rewards for playing vs. the Computer or vs. your friends. Several Missions also reward rival cards directly, so it’s easier to unlock rival slots now. However, to balance the increased rewards you can gain through Missions, we have adjusted the coins that are rewarded through playing games. Now you earn 15 coins for a win, 10 coins for a tie, and 5 coins for a loss. This sounds like bad news, but as we mentioned before, we are in beta and we will have to adjust the game economy from time to time. The old rewards were temporarily high to make up for the fact that other features weren’t ready yet, but now it’s time to bring them back down to the amounts we originally planned. Also know that we are planning even more ways to earn rewards in the next few updates, through features such as Alliances and Campaigns (more info on them soon). Today’s update also includes art improvements in the game screen. 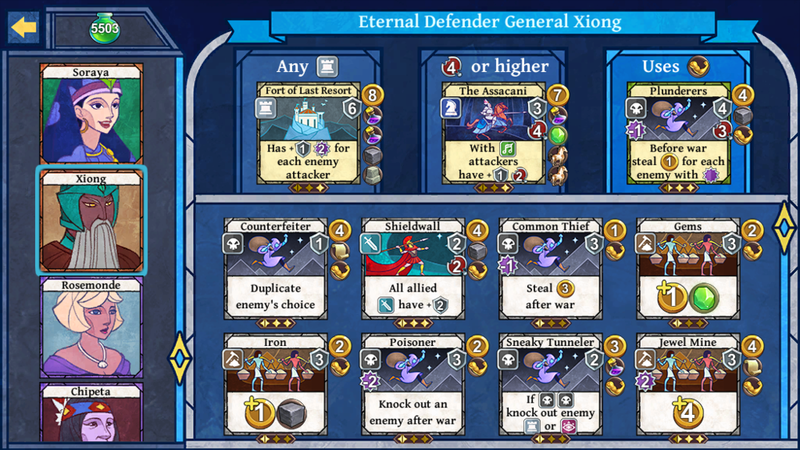 And finally, we have made several bug fixes related to several cards: Silencers, Master Thief, Bastion, Briliant Tactician, cards with blocking effects, and more. As always, we want to hear what you think. Thanks for playing! Why did I build Age of Rivals? Late last year, I was trying to find the perfect game for my wife and I to play on any given weeknight after putting the kids to bed. Our favorite games to play together are strategy board games, but many of those are hard to set up and play on a weeknight if we’re already low on energy or time, and they're usually more fun with a group. I really like CCGs like Hearthstone because of how replayable they are, but my wife does not like the deck-building aspect. She doesn’t want to have to figure out a strategy before the game can start. We wanted to just be able to jump into something with no setup and have a fun, fair game where we try to outsmart each other. Over and over again without it getting repetitive. So this is the game I set out to try to design, and with lots of help from Curt and Mathilde, we ended up with Age of Rivals. Why is this the perfect game for us? It’s digital so there’s no setup or rule tracking, and players take simultaneous turns. Less downtime, more fun time. Games last about 15 minutes. Unlike many digital board game ports, it’s designed to fit on a single screen, large or small. No panning the screen or squinting at small text. There’s no deckbuilding required. It’s all about the moment-to-moment tactical decisions. You design your strategy as you go. Any card you own might show up in any game, so all games end up being surprising, unpredictable and unique. The interactions are simple. Just choose 1 card out of 4. Abilities are always automatically triggered and targeted. A strategy gamer to play with a more casual gamer. Players start the game on equal footing. Just draft the best 16 cards you can. CCG fans (Hearthstone) who just like trying to outwit an opponent more than they like building a deck, and who want every game to be surprising and have maximum variety. Board-game fans (7 Wonders, Dominion, Through the Ages) who want a quicker experience with no setup, cleanup, or rule tracking, and that fits well on a phone-sized screen. Fans of civilization-building games (Civilization) who like to try to balance the concepts of culture, economy, offense and defense, but want to do it in a distilled, 15 minute experience. We think Age of Rivals combines the most fun aspects of our favorite board games and CCGs in a unique way. We hope you agree!